Japanese art site Pixiv is holding a fan art contest to celebrate the upcoming film Twilight: New Moon, and one of the judges is none other than Mr. Metal Gear himself. Didn't see this one coming: Renowned game creator Hideo Kojima has been tapped as one of the judges for a Twilight fan art contest run by Japanese art site Pixiv - think DeviantArt, only Japanese. The contest is meant to coincide with the upcoming Twilight: New Moon, the movie based on the second book in Stephanie Meyer's ridiculously successful novel series about teenage vampires that sparkle in the sunlight. Kojima is one of three judges, all of whom are reportedly "huge fans" of the series according to the Pixiv announcement. He will join Yoshiyuki Sadamoto, who is best known for his work as the character designer and manga creator for the landmark Neon Genesis Evangelion, and Ryuji Gotsubo, creator of the manga Sasameke and illustrator for the Japanese releases of the Twilight novels. All three judges have their own prize packages to award to the winner as they see fit: Sadamoto will be giving away an autographed painting set, Kojima an autographed copy of Metal Gear Solid 4: Guns of the Patriots, and Gotsubo "an autographed set of the first three Twilight tankōbon novel volumes," according to the Anime News Network. The Pixiv community will also be able to choose 10 winners of its own, who will each be given two tickets to the film when it launches in Japan on November 28th. 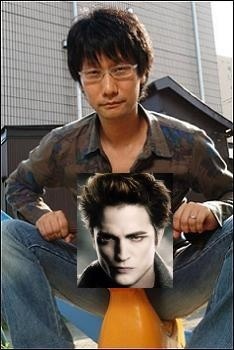 Kojima strikes me as more of the Team Jacob type than Team Edward, wouldn't you say?